From here your audio collection can be browsed (by artist, album, etc). Dynamic Browsing offers a way to customize the listing (Artist, Album, Tracks etc) results using inclusion or exclusion principles. The easiest way to describe is through example, for example you are having a party and you want Music from the 80's and 90's, but you want to exclude the Genre Classical and Genre Soundtrack, you would: Browse into Dynamic Browsing, do the included items first, so select Year >> 1980's, and Year again >> 1990's. Now the exclusions, select [Exclude] >> Genre >> Classical, and [Exclude] >> Genre >> Soundtrack, finally [List Albums] is selected (or [JukeBox Album Selection] for a random selection of albums). Least Played... : 100 Tracks or Albums which have been played the least. Internet Radio [TuneIn Radio] enables browsing of popular radio stations by Genre or location, a favorite list of stations can be created on the web site www.tunein.com and assigned to a user name which can be entered into Asset Configuration (see later) to allow access to these favorite stations. Folders & Filename Browsing: browse the audio tracks exactly as they appear on your computers HDD. Asset is accessed from a configuration page, this page is reached on the QNAP by clicking 'Launch' on the Asset tile, in the App Center. On Linux, the configuration page is http://x.x.x.x:45537 where x.x.x.x is the IP address of the machine on which Asset runs. 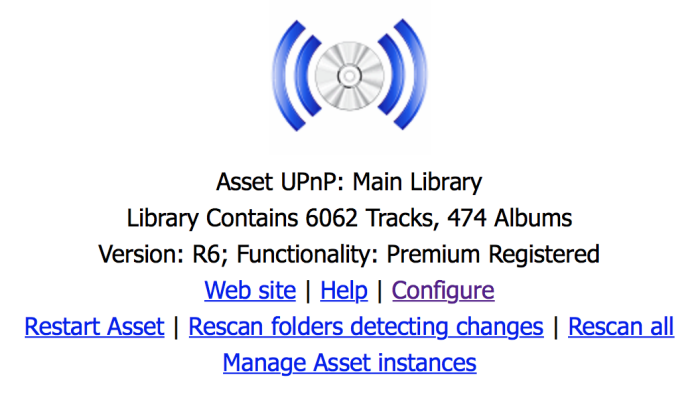 The configuration page shows Asset version, its registration status and the library track / album count. The library can be rescanned, detecting changes is a fast rescan looking for changes, Rescan all re-reads each track ID tags. 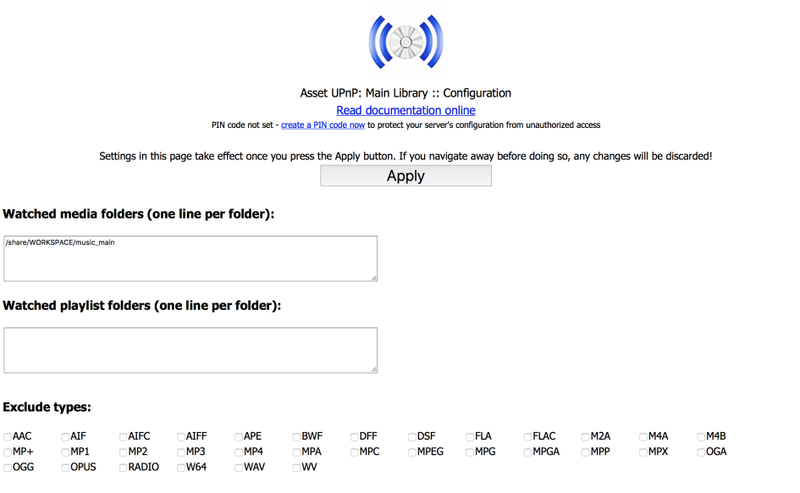 Clicking configure allows the Asset instances page to be accessed, by default one instance of Asset is defined, each defined Asset can be thought as a separate server, each with their own settings or music library. It is possible for example to have a Christmas Asset indexing just festive tracks, this instance of Asset can be disabled once Christmas has passed. Watched Media Folders specifies which folder(s) Asset should scan for audio, on Linux it should start '/', the QNAP version of Asset should auto-detect the correct media folder. Watched Playlist Folders can be used to indicate to Asset where your playlists are stored, sub folders are not scanned, found playlists will be presented under the Playlist entry in the main browse menu. Exclude Types can be used to inform Asset to not add certain types of audio files (for example your library consists of FLAC lossless files and mp3 files created from the FLAC files, in this instance mp3 should be excluded). [track #] - [title] for album tracks: is useful for control points which do not display a track number when showing an album, this option embeds the track number into a title. [title] - [artist] for Title Listing: someone requests the title Breathe, you might find there are 3 Breathes in your collection (David Grey, Kylie, Prodigy), this option for Title browsing only will place the artist after the title. [album] - [artist] for album listings: for control points which do not display artists when browsing albums this option places the artist onto the album name (only for browsing), useful when looking for The Greatest Hits, as there could be 10 albums. Multi-Disc Albums show as '[Disc] [Track] [Title]' many albums are released as multi-disc-albums, such as a Greatest Hits collection. Normally one album would be listed 'Greatest Hits' and tracks from disc 1, 2, 3 are all present under the same album (3 track 1's, not good). With this option checked there each album would follow in the correct order in one album folder. Multi-Disc Albums show as 'Album, Disc x' many albums are released as multi-disc-albums, such as a Greatest Hits collection. Normally one album would be listed 'Greatest Hits' and tracks from disc 1, 2, 3 are all present under the same album (3 track 1's, not good). With this option checked there would be 3 albums presented 'Greatest Hits, Disc 1', 'Greatest Hits, Disc 2', etc. Multi-Disc Album specifies how multi disc albums are displayed, by default Disc 2, etc are combined into the one album. Size Album Art allows the maximum art size to be set when browsing though a hand-held controller, the reduced size will give quicker responses. 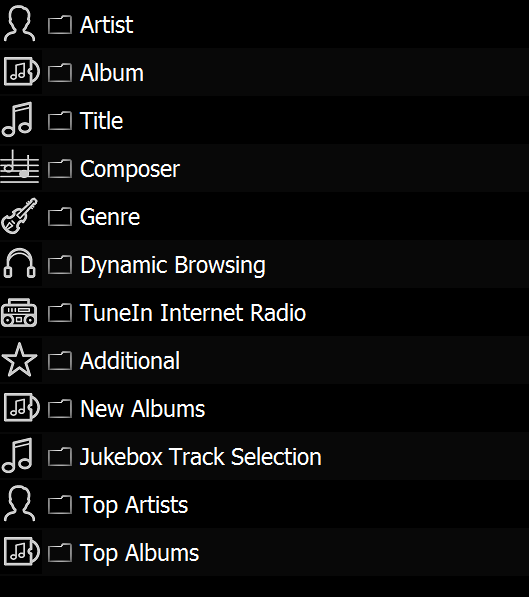 Contributing Artists with Main Artists typically audio tracks might include featured artists (multiple artists), normally contributing artists are searched through Advanced Search >> Contributing Artist, with this option checked these 2nd artists are added to the main Artist browse. Hide Main View Albums: when browsing by album it might to advantageous to not list CD singles, this option can filter those. Tunein Username allows favorite radio stations to be added an a user account (free to create) on tunein.com, type the user name into asset to access these favorites. Library Exclusions enables tracks to be excluded based on ID Tag matches, for exmaple you could exclude all tracks with the genre Christmas, from your main library and include only Christmas genres in a 2nd Christmas instance of Asset. Clicking [Edit] shows details on how to perform this. User Rename List (Display / Tag mapping) enables the shown tree names to be replaced, or ID tags to be changed (perhaps to blend all 'Pop / Rock' genres to 'Pop). Clicking [Edit] gives details of how to perform the renaming. Debug Logging Enabled can be used to diagnose problems, it should not be left enabled as the debug logs can grow very large. The player does not support the audio format directly, Asset is able to allow the player to play the audio tracks by decoding them to PCM (either Wave or Linear), or mp3. Note that decoded audio files have no quality loss (unless mp3 is used), they are as the player would play them (when it decodes), if a format is left 'as is' it is sent untouched to the player. The option 'as is single' allows for say flac to only be offered as flac, normally 'as is' would offer FLAC, LPCM, WAV, FLAC this enables a player to pick FLAC if it supports, but also automatically chose LPCM or WAVE if it does not, as is single would only offer FLAC. Apply ReplayGain ReplayGain is a method of measuring loudness of audio tracks and altering the overall loudness, enabling tracks from different albums to have the same volume levels (modern popular albums are much louder than an album from the 1980's). ReplayGain requires that the audio tracks have an embedded ReplayGain ID Tag (dBpoweramp is able to add this tag to files, install dBpoweramp and the ReplayGain utility codec from Codec Central on dbpoweramp.com, then run the program 'Batch Converter', select the main audio folder (normally Music) and select Convert >> choose the encoder the [ReplayGain]. This method only scans the files and adds ReplayGain values, the audio is left untouched). Only tracks which are streamed (in a format other than 'as is') would have replaygain applied. If the player supports 24 bit audio then enable this option as it allows ReplayGain adjustments without any loss of bit depth when playing 16 bit tracks, also set the Active and Inactive pre-amp to -3 dB. Maximum	option can be used to allow a player to play higher bit-depth files than it can normally support (by automatically converting 24 bit to a maximum of 16 bit), obviously though not at the higher resolution. Asset allows customization of the browse tree, simplify it by removing items, or add new browse-able items. Items shown as +\ are child items of the one above. After the item is added change it's name to the type of item that is browsed by, [A to Z] can be checked for an item allowing selection of A to Z before presenting the full list. No Track Listing prevents track listings for a given container, an example of this is 'Genre' which has this set, as the track listing is prohibited until Artist then Album are selected. Restore Default allows the restoration of the Browse Tree to default settings.